As CES 2013 gets underway, it finds the Quantified Self movement to be a far more crowded market than a year ago, but as Matt Burns pointed out recently, the market is still hungry for smarter devices and “plenty of room” remains for startups for startups to push the envelope with innovation and press beyond movement and weight. With digital health data proliferating, wearable health-tracking devices (and the sensors that makes them tick) maturing, the improvements in remote diagnosis and with the mobile health app economy beginning to boom, there were a lot of exciting developments at the crossroads of health and technology in 2012. Rather than an end-all-be-all report, Rock Health’s year-end research is meant to provide a highlight reel and offer some food for thought as a new year sets in motion. In terms of methodology, Rock Health Co-founder and CEO Halle Tecco tells us that the accelerator captures everything related to digital health filed through the SEC and anything that was announced publicly, before cross-checking that information with Capital IQ, CrunchBase, VentureSource, among other resources to create a baseline. The reasons for this include — among others — a lackluster IPO market, pricing and regulatory pressures, which led to constriction in venture capital and more cautious investment strategies in the health market. This means early-stage companies have been struggling to raise funding, there’s less access to capital in general, which adds further inertia to R&D, device testing and more. Rock Health’s year-end report paints a different picture; if not drastically different, at the very least a contrast. According to its research, in 2012, digital health startups saw 45 percent more investment and 56 percent more deals compared to the year prior, with total capital invested growing from $968 million to $1.4 billion. 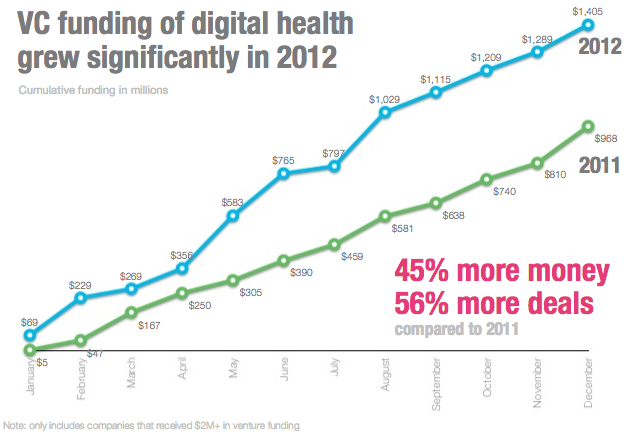 The report shows that, while investment in traditional healthcare is drying up, funding for digital health has grown. Across all sectors, investment fell 2 percent, thanks largely to biotechnology (which fell 4 percent) and medical devices (which fell 16 percent). Meanwhile, funding for software rose 19 percent and digital health grew 45 percent. 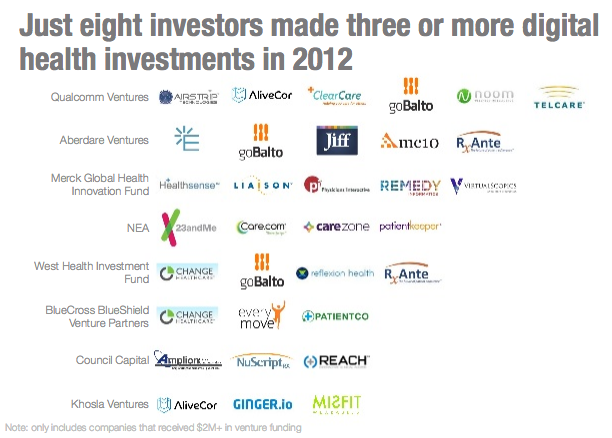 All in all, 134 digital health companies raised $2 million or more in 2012, with four areas representing over one-third of the total investment. Personal health tools and health tracking saw $143 million, while consumer engagement saw $237 million, EMRs (all those that capture clinical information and its corresponding app ecosystem) saw $108 million and hospital administration found $78 million. In addition, the report finds that over half of deals done in 2012 were rounds greater than $5 million, and the largest five deals represented more than half of the year’s total funding. The largest digital health investment of the year went to Castlight, which raised $100 million in May, led by T. Rowe Price, and Redmile Group, with contributions from its previous investors, including names like Morgan Stanley, Wellcome Trust, U.S. Venture Partners, Maverick Capital, Oak Investment Partners and Venrock — to name a few. Following Castlight was GoHealth, which raised $50 million from Norwest Equity Partners in June for healthcare comparison shopping, Care.com at $50 million in August, 23andMe at $50 million in December for genome analysis and August’s Best Doctors raise at $45 million. Rock Health also found that some of the larger deals from 2012 could lead to a stronger IPO market for digital health companies, with Practice Fusion, Castlight and ZocDoc all fitting the bill of potential IPOs in 2013. As for investors, 179 organizations invested in digital health companies in 2012, however, the vast majority only made one investment. This shows that, while the market may be heating up and investment is starting to make its way to digital health, investors are still wary — and still testing the waters. According to the report, Qualcomm Ventures made the most digital health investments of any investor (keep in mind this is for publicly available data) with six investments, followed by Aberdare with five, Merck Global Innovation Fund with five and NEA with four. Rock Health also notes that the Bay Area and Boston have established themselves as the two geographies leading the way in digital health activity (and investments). The problems? The report shows that, while funding is hardly scarce, digital health startups are still struggling to find talent (as is every sector) and that, across the board, more than 600 positions are currently available within these businesses — a silver lining for job creation, however. Women also remain underrepresented as CEOs of healthtech startups, as only 7 percent of CEOs in the space are female. In sum, I’m sticking to my analysis from October. While investment might be drying up in certain areas of the health industry, that’s not necessarily a bad thing. Just as we’ve seen happen to the music and publishing industries, there won’t be many investing in building more printing presses and better CD distribution. Healthtech investing is going to shift away from administrative, claims processing and Life Sciences as a whole to digital health and businesses focused on affecting outcomes, those that improve decision support, care coordination and patient engagement. Now, digital health needs more talent and more talented women. If all these elements fall into place (admittedly, a tall order), 2013 is going to be a banner year for the industry. Alert! Shameless self-linking ahead: For a round-up of 2012’s best digital health and fitness apps, gadgets and startups, check out our list here.